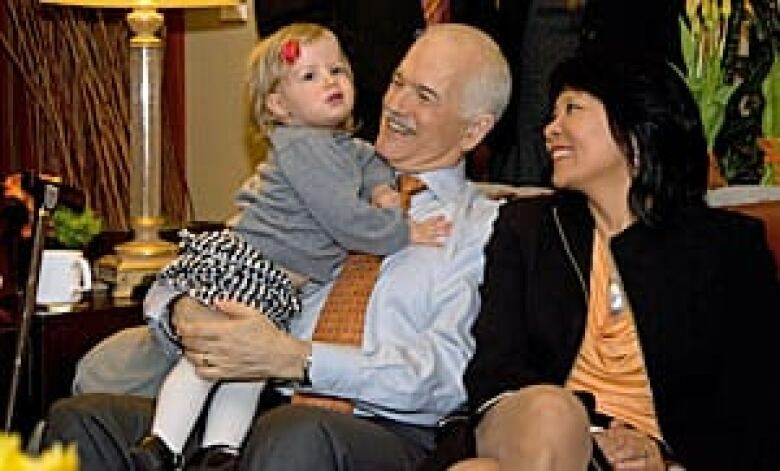 NDP Leader Jack Layton declared "a new chapter begins" after his party easily vaulted over the Liberals in Monday's federal election - the first time in history the New Democrats have become Official Opposition. 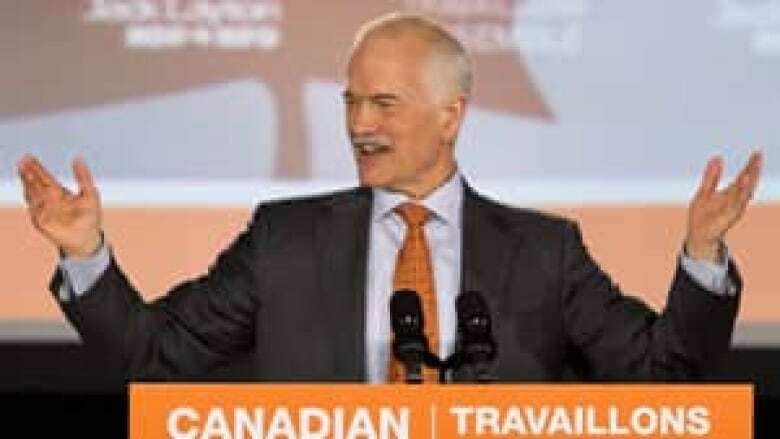 NDP Leader Jack Layton declared "a new chapter begins" after his party easily vaulted over the Liberals in Monday's federal election — the first time in history the New Democrats have become Official Opposition. Layton's campaign got off to a slow start, but it took off after the English and French debates, when polls suggested his party was gaining, especially in Quebec at the expense of the slumping Bloc Québécois. Layton was re-elected in the Toronto-Danforth riding; his wife, Olivia Chow, was also re-elected in the city's Trinity-Spadina riding. A smiling and jubilant Layton celebrated at the NDP party in Toronto with hundreds of supporters who chanted "NDP, NDP, NDP" loudly. "You are amazing," he told them. "Spring is here, my friends, and a new chapter begins." The NDP went into the campaign with 37 seats, compared with 77 for the Liberals and 143 for the Conservatives. Layton's total this time will be 102, as the Liberals and Bloc slumped badly. The NDP was looking at winning 59 ridings in Quebec alone. The Bloc was down to four seats as votes were being counted Tuesday morning. These are historic numbers for the NDP, who now have the biggest block of seats aside from the Conservatives. Harper's party was declared majority winner of the election just before 11 p.m. ET, with more than 160 seats in the 308-seat Parliament before the official count was completed. As of Tuesday morning, the party had taken 167 seats. "We've been absolutely fixated on making sure that we run a first-rate campaign with a strong message, and we knew that message out there was, 'Ottawa is broken, it's time to fix it. It's time that it works for families to get things done,'" NDP national director Brad Lavigne told CBC Monday night. "We attached that to the right demographics in the right ridings across the country, and the great thing about tonight is that the growth is everywhere. It's in Atlantic Canada. New seats in Newfoundland and Nova Scotia. Throughout Ontario and the West." Layton, who had hip surgery just before the campaign, was often seen at rallies waving his cane in the air — his now-signature move — and exhorting his followers to push ahead. The NDP rallies grew bigger and bigger as the campaign went on. Layton told the cheering crowd at his election party at Toronto's Metro Convention Centre that Canadians had voted for public health care and helping families, and he would work hard for them. Layton said he called to congratulate Harper and said it was a considerable accomplishment winning a majority. Layton insisted he would work to adopt a more respectful tone in Parliament and would meet with Harper shortly to talk to him about how "to get things done for families." Some in the crowd booed when Layton mentioned Harper's name. He congratulated Green Party Leader Elizabeth May, the only Green member who won a riding, as well, to loud cheers from the crowd. The crowd went wild when Layton said the NDP would be the Official Oppositon for the first time. Layton said the party would offer positive solutions in Parliament and fairness would be a fundamental part of working on economic issues. "Canadians have elected a new generation of New Democratic MPs from across the country," he said. He also told Quebecers that his party would fight hard for them, and thanked the younger voters who went to the polls for the first time. Layton said the NDP's success has been "50 years in the making." After national polls suggested the NDP was moving past the Liberals into second place, Layton became a target of the other parties. Harper took aim at the NDP platform, saying it contained $20 billion in hidden carbon taxes that would kill jobs. Liberal Leader Michael Ignatieff tried to lump Layton with Harper regarding past decisions made by the parties. "Now, the old parties are spending the last week on the attack, hoping to drown out the voices for change in Canada," Layton said near the end of the campaign. But it was Quebec where Layton's big gains took place, after the Bloc seemed to take voters for granted and did not run a stellar campaign. The Bloc went into the election with 49 seats in the province. Layton pushed his "winds of change" message throughout the campaign, and by the end was talking directly about taking on Harper for the prime minister's job. "About half of the NDP caucus will be from Quebec. The next four years will be tough for us because there is a lot of hard work to do and we will be standing up against a blue machine and we know what we have ahead of us," said Thomas Mulcair, the NDP's finance critic from Quebec. Party members rejoiced at the party as the victory sunk in. "Amazing. It's been just amazing to watch the NDP grow," said Steven Lee, 33, recalling when Layton won the party nomination. "It's bittersweet because even though we won the Conservatives got a majority. To me that's the scariest thing."